Here is a recipe I've done a few times and like a lot. Mix it all up like a meat loaf, blend it up and mix it and shape it together. 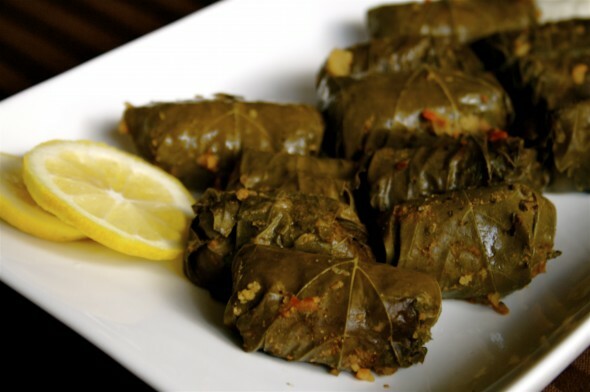 Unfold the grape leaves carefully, then take one leaf at a time and place enough of the meat mixture into the leaf before rolling it up halfway, folding in the sides, then rolling the rest of the way to form the domlade. Place into a gallon pot. If you run out of leaves form the remaining meat into small meatballs and add to the rest of the pot. Fill pot with chicken broth till the dolmades are covered, then bring to a boil and reduce to simmer for 45min - 1hour. Extra meatballs on top can be a strong indicator of how well done they are. Whisk eggs together while slowly adding lemon juice squeezed from 4 lemons till frothy, then after letting the dolmades cool for a bit, ladle about 1/4 - 1/2 the stock from the pot into the lemon sauce very slowly while whisking it to prevent it from curdling. Drain remainder of stock, then replace with sauce, cook for additional ten minutes on low to medium heat, then serve. Sadly, Kroger had no lamb when I cooked these and they were all beef, and they were greatly lacking because of it.